Lightly grease an 8 or 9-inch cake pan; set aside. On a lightly floured surface, roll thawed loaf into a 10×12” rectangle. 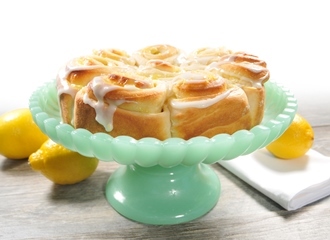 Spread lemon curd evenly over dough and roll up in jelly-roll fashion starting from longest side. Cut into 8 equal slices*. Place each slice swirl-side-up in prepared pan. Brush rolls with melted butter and let rise in warm area until double in size. Bake in a preheated 375° oven for 20 minutes or until lightly brown. Remove from oven and brush again with melted butter. Let cool in pan. To make icing, combine powdered sugar and lemon juice in a small bowl. Stir until smooth add more lemon juice or water if it is too thick (you should be able to drizzle from a spoon). Once cooled, drizzle with icing and top with lemon zest. *Use dental floss to cut rolls instead of a knife to keep the swirls looking pretty! Simple get a long string (about 24 inches) of unflavored dental floss. Hold each end of the floss with each hand. Slide under log of rolled up dough to where you want to cut it. Bring floss up on each side and criss-cross your hands over the dough to slice. Repeat for remaining 7 rolls.